While maintaining the layout, most of the spaces have been remodelled. At first glance we find the foyer, covered with KRION 6909 Colosseo Grey, along with a shelf created with the new Royal Series colour, 8905 Blackness, and a lattice in 65005 Taupe. Continuing through the room we enter a comfortable little room with a fireplace created with 6100 Frost White and 9905 Elegant Black, the second lattice completing the space, in Royal+ Series colour 9509 Dark Copper. 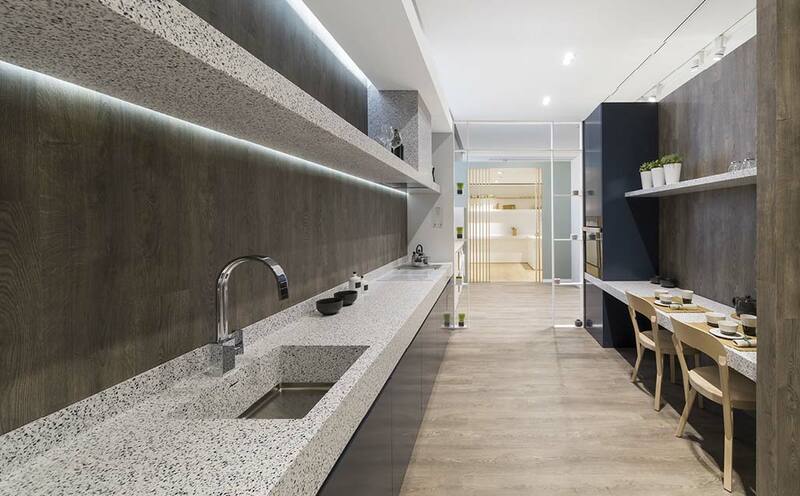 The new kitchen shows us the latest products from the Terrazzo Series, T103 Antico Bianco, with shelves of the same colour and an SC810 50x40 Satin sink. In the exit just in front of the Workshop, the new Slide series washbasin, B822 55x33, is found, embedded in a 9105 Elegant White countertop. During the previous edition of the Exhibition, the workshop area was very well received. The possibility of matching and combining materials make this area a space where professionals imagine their projects and combine results. This year, the concept has been maintained, creating aesthetic changes, the most significant in the wall where all KRION Bath washbasins and sinks are embedded, the rest being an open book for professionals to write their own story.